A major search for two fishermen missing after their boat capsized in Loch Fyne in Argyll and Bute has been scaled back. The alarm was raised by a third man who was pulled from the water by the crew of a passing boat on Thursday evening. Despite efforts of those on scene to keep it afloat, the 40ft Nancy Glenn TT100 fishing vessel sank. Lifeboats, a coastguard helicopter and rescue teams, as well as local boats, have been searching for the men. The operation has now been scaled back and further efforts will resume in the morning. Julie-Anne Wood, head of maritime operations for HM Coastguard, said: "Sadly we have been unable to locate the two missing fishermen. Insp Julie McLeish added: "We are in regular contact with the missing men's families. "It is a very distressing time for them and the local community as a whole. "The search will continue until dark tonight and will resume again at first light tomorrow." The Marine Accident Investigations Branch has started an investigation. Tighnabruaich, Arran and Campbeltown RNLI Lifeboats were sent to the sea loch, alongside the HM Coastguard Prestwick helicopter and Coastguard Rescue Teams from Tarbert, Kames, Inverary and Crinan. Campbeltown RNLI Lifeboat was out all night on Thursday searching for the missing men. 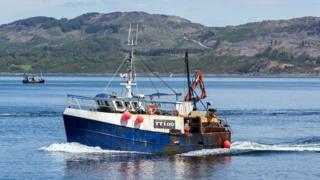 It is understood the entire Tarbert fishing fleet has also been helping with the search efforts. A spokesman for Tarbert and North Kintyre Churches said: "This is a close-knit fishing community and everyone is absolutely devastated by what has happened. "The Church of Scotland and Free Church of Scotland are working closely with Matthew Ramsay of the Fishermen's Mission in Argyll to support the community and the emergency services personnel involved in the search operation. "Our thoughts and prayers go out to everyone affected by this heart breaking incident." The man pulled from the water was transferred to Mid Argyll Community Hospital in Lochgilphead, where staff describe his condition as stable. Police and the Marine Accident Investigation Branch (MAIB) are carrying out a joint investigation to establish what caused the incident. Earlier Jonathan Hart, area commander for the coastguard, told BBC Scotland: "I have been to see each of the families in the local area and I have given them my reassurance that we are doing everything we can to recover their families."